Hey readers, I’ve got a scoop. It’s the text of a letter – don’t ask me how I got it – from Israeli Prime Minister Netanyahu to Hamas leader Meshal. It was hand delivered in Gaza by one of Israel’s many Palestinian collaborators who lives there. Like most if not all others of his kind, the poor man didn’t volunteer to spy for Israel. He was “recruited” after being told that his wife would be raped if he didn’t provide information for Israel. Many years ago, as I noted in my book Arafat, Terrorist or Peacemaker?, Abu Iyad, Fatah’s intelligence chief, told me that most Palestinians who became Israeli assets did so because they were told that their mothers, or their wives, or their daughters or their sisters would be raped if they didn’t do what Israel’s security agencies wanted. “It’s Israel’s standard procedure,” Abu Iyad said. (During Israel’s ground and air assault on Beirut in 1982, a Palestinian woman came to Abu Iyad and confessed that she was an Israeli agent, one of 30 who were reporting on Arafat’s movements to enable Israeli jets to zero in and bomb him to pieces. Abu Iyad had the other 29 rounded up and shot. He didn’t tell Arafat until they were dead because he knew the chairman would have insisted on mercy and forgiven them). Why am I moved to thank you? I’ll tell you very frankly. You have solved what was threatening to become a serious problem for me. For some months past European leaders and even people with an inside track to my very, very dear friend Barak Obama have been telling me that I do not understand Hamas’s real position. Time and time again I have been told that if I want to do what is best for Israel, I must look beyond the rhetoric Hamas leaders use to keep hope alive in the hearts and minds of their supporters and Palestinians everywhere. Hamas’s real position, I have been told, is that while it will never, ever, recognize Israel’s right to exist, it is prepared to accept the reality of Israel’s existence inside its pre-1967 borders, The obvious implication, I have been told time and time again, is that Hamas has become pragmatic and is prepared to negotiate on the basis of an end to Israel’s occupation of the West Bank including East Jerusalem, to enable the creation of a Palestinian state which would live in peace with an Israel as envisaged by the letter and spirit of UN Security Council Resolution 242. I have even been shown “evidence” in the form of newspaper reports which quoted you and other Hamas leaders categorically stating your readiness for peace or at least “a permanent truce” with an Israel inside its pre-1967 borders, with East Jerusalem the capital of a Palestinian state or an undivided Jerusalem the capital of two states. We both know this is a deception on Hamas’s part. You revealed its true face in your speech in Gaza. You want to destroy the Jewish state. Thanks to what you said in Gaza, I can now look European and other leaders in the eye and say, “It’s not me who doesn’t understand Hamas’s real position, it’s you.” And if they continue to tell me I should accept Hamas as a party to negotiations, I can and will tell them to go to hell. As I told my cabinet colleagues shortly after you had spoken in Gaza, if we handed over territory in Judea and Samaria, we’d be inviting rocket and missile attacks from there on Tel Aviv. And that, I told my colleagues, is why no government I lead will ever bow to international pressure and put Israel’s security at risk. The old year is about to end and my wish is that you won’t see a new one. All I want to add for the sake of discussion of the kind I once had with Arafat is this. Arafat added, and surely he was right, that having struggled so long for some justice, his people would not be mad enough to give Israel the pretext to close the Palestine file for ever. The only madness is in the mind of Netanyahu and more than a few of his cabinet colleagues. And one more point. The man who is contributing most to the process that may well lead to the destruction of the “Jewish state” is Netanyahu himself. If that was only my Gentile opinion it would not matter, but there is today a still small but growing number of Jews, including some Israelis, who are aware of this and saying so. I like this article, in its entirety. But your happy final words give me pause. No one since Marx or Stalin or Hegel (I am no historian or philosopher) has believed in historical inevitability. N-yu could win all the cookies and will surely keep trying to do so. How could any peacenik (of ANY flavor) join hands with Lieberman? N-hu's policies are as intransigent as Meshal's words seem. So I don't see N-hu as stopping doing what he's doing, whatever Meshal does or says. However, there will surely be a resonance for the anti-Hamas (or anti-Palestinian) ideas in your "letter" among American Zionists (tho maybe that will not make them any more intransigent than they already were). What Meshal said will not ease the crushing burden of the coercive social mechanisms which exact willing or unwilling line-toeing from AIPAC's followers. As Helen Thomas said in 2010 – European Jews should return to their motherlands in Europe – because Palestine is not their land. The same year, the Vatican issued its FATWA that the biblical concept of the “Promised Land nor the Chosen People ”doesn’t justify the building of new illegal Jewish settlements nor the occupation of the Holy Land. The two-state concept was proposed by the notorious 1917 Balfour Declaration which was ignored by David Ben Gurion in 1948 when he unilaterally declared the establishment of a Zionist state over 56% of the historic Palestine. 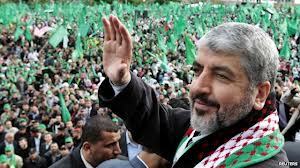 What Meshaal meant was a “single state” for the entire historical Palestine. No one his right mind will expect Meshaal to call for the “wipe of Israel from map”, as Meshaal has already joined the US-Israel-Saudi ‘Axis of Evil’. He is no different than the “double agent” Mahmoud Abbas. It was not Hamas which brought Israel to the negotiating table last month – but Islamic Jihad, by raining Iranian-made rockets and missiles. Bravo Mr. Hart. Thank you for your objective, accurate and informative commentary. If this is Netinyahoo; how childish. I have stated previously that the zionists I have spoken with personally; fail to meet basic intelligence levels for adults. While I have always felt netiyahoo to be mentally incompetent, it is a shock to be confronted by a leader who has such a low developmental age that he may well be classified as retarded. I can find no other conclusion other than that the actions of zion are being directed by parties from outside of Apartheid israel. How else can it be explained that he is so well known among global leaders and yet not disregarded out of hand? He must have some powerful backing. As I've said, the notion of a two-state solution plays right into the hands of the Zionists. Because once a Palestinian states comes into existence, the first rocket launched by some dissident who isn't with the program will cause Israel to annihilate the Palestinian state. And that's exactly what the Zionists want. They will fight against a Palestinian state because they would prefer the Palestinians just shut up and go away. But if such a "rump" state ever exists, they will destroy it. The two-state solution is a trap. The only solution (impossible as it is likely to be realized) is one state, enforced by the international community. The UN actions of 1947 must be reversed, and a new state created with a new constitution which unites Jews and Palestinians. The alternative will be either the ethnic cleansing of the Palestinians in slow motion as currently being done, or the genocide of the Palestinians as a result of a Palestinian state being destroyed militarily by Israel. In early June 2010 – it was reported that a prominent Israeli psychiatrist (shrink), Moshe Yatom, committed suicide. He left a note which said that Israeli Prime minister Benjamin Netanyahu, who has been his patient for the last nine years, had “sucked the life right out of me”….. “I can’t take anymore”. One week after Moshe Yalton’s suicide – Yigol Peleg, who had been treating Israeli Defense Minister, Ehud Barak, also committed suicide from an overdose of valium. His suicide note stated that Yalton’s failure to cure Netanyahu has provoked widespread despair in Israel’s psychiatric community, which fears a therapeutic remedy for doublethink is much more remote than previously believed. The above incidents reminded me of a study conducted by Dr. Arnold A. Hutchnecker, a New York psychiatrist, for the American Psychiatric Association and published on October 25, 1972. Dr. Arnold Hutchnecker’s patients included US President Richard Nixon (d. 1974). The study was published under the title, Mental Illness: The Jewish Discease and concluded that “although all Jews are not not metally ill, mental illness is highly contagious and Jews are the principal sources of infection”. I know I'm preaching to the choir but Netanyahoo is a gangster politician and, while he has an argument, he doesn't believe it. He knows very well that Israel can crush any state that attacks it in the region. He is just using this to score points with EU and the US. His plan is complete sovereignty over all of Palestine -- this has been the Zionist goal from day one and nothing they say or even do should lead a historian or a person of conscience astray. They want it all and aim to have it and the world can go to hell for all they care. They are nationalist lunatics and what they are destroying is not Israel but Judaism because I, like other Jews, want nothing to do with Israel or these gangsters and I have stopped practicing the religion, going to schul, doing the candles and the Shabot. The hell with them. And I'm sure I'm not alone. Thank you Alan, I always appreciate your wise views of the conflicts in Palestine and the remorseless black hole called Zionists. When I heard Khaled Meshal's speech reported in the media I was dismayed. I don't speak Arab or Hebrew so I have to rely on what the news presents but my sheer dimay was Meshal's words about anailating Israel. He may have been stirring up the crowd and playing to a local audience but in effect what he has done is given Netanyahu exactly the ammunition he needs to gain more sympathy around the world saying, look poor little Israel is under threat again, we need your help". The Palestinian people need smarter people than this to lead them, then they can get on with the business of both outsmarting the Zionists and winning active international support. 'Bibi'? In Spanish there is the word 'BOBO', which means idiot - it suits Netanyahu much better. This is so perfectly a representation of Netanyahu's arrogance and chutzpah that I'm not at all astounded that he would send such a taunting and absurd missive to Meshaal. Truth is, it doesn't matter what Meshaal or anyone else says or does. Bibi is going to take the West Bank and East Jerusalem, come hell or high water, if he gets his way. He just loves it whenever any rhetoric comes from the Palestinians that he can point to, to justify the evil he is committing against them. He reminds me of J. R. Ewing, the infamous bad guy in the old TV show "Dallas" and who was played by the recently-deceased actor, Larry Hagman. J. R. was slick, urbane, smiling, charming the world, but in his private dealings with his enemies he was completely amoral and totally ruthless. Needless to say, I'm curious about whether Meshaal responded to this letter, and what he said. Alan, all your posts are priceless, but this one takes the biscuit. I reached the conclusion some time ago that the "masters of the Universe", all our rulers, be they politiciams or financeers, are psychopaths. But some are more pshycopathic than others, obviously. Also, some are dowright hysterical. As for the point of Israel destroying itself...again, I advanced that possibility three years ago. But three years ago this could not be said in public. Lots of things that are now being said openly were taboo just 5 years ago. Will this make any diffrence to the situation? I wish I could think so. Shocking so how many Palestinian women were actually raped by Israelis since 1967? Alan, were Meshal's defiant words wise politically? Are you convinced that the supposed letter from Netanyahu is authentic? Also, I am constantly dismayed at the name-calling I find in comment sections. I don't agree with Netanyahu, et al, for one nano-second. But calling him an idiot is simply a personal attack and does not advance the discussion one iota. It's language I expect from the uninformed and who choose not to argue based on fact, not from people who are educated about this issue. The English translation of Meshaal's speech reported by western media was done by Jewish-Israeli MEMRI which Ahmadinejad's famous quote: "Wipe Israel off map". Addressing a crowd of estimated 500,000, Meshaal said that Palestinian will never recognize the legitimacy of Zionist occupation. He said that Palestinian don’t fight Jews but the Zionists who are occupying Palestinian land. “We will continue to fight them until we recover Palestine inch by inch,” he said, adding that ”liberating Palestine, all of Palestine, is the duty and right and goal of all Arabs and Muslims“. Most political informed public don't believe the "poor little Israel" any more. It's world's fourth largest airforce and 300 nuclear bombs. Economically, Israel is doing for better than its donor United States. Growing by 7.8% in 2010, the Israeli economy ranked fifth highest in growth among the world’s most prosperous OECD’s 34 members. Israel’s growth outstripped that of the United States, Britain, Japan, Germany and France. Rehmat: "Wipe Israel off the map" was used (and defended) by both Reuters and the BBC. It was also used in Iranian government English websites. Here is a BBC explanation for their use of the phrase. I'll also mention that there's a big argument about this one particular occasion in October 2005 when Iran made this threat because it caught international attention. The truth is that Iran has made similar threats both before and since this event. Iran's government is bellicose and belligerent; just because they threaten Israel the international whipping boy, does not change that. @Brad Brzezinski - Jewish-controlled BBC had also claimed Saddam Hussein had WMDs as it's now claiming Assad is going to use WMDs on Syrian (read US-Israeli funded insurgents). Read the Zionist lies debunked at a Jewish-owned website. So no answer as to how many Palestinian women were raped since the occupation started? I mean it has to be A LOT to have the Palestinians feel it is a real threat. It coun't be around zero could it? Rehmat: Your link deals with the one incident, but as I said, there have been many. BBC: Substantiate your claim that it is Jewish controlled. I see no evidence of that. And if the BBC is Jewish controlled, what is your objection to that? So if Hamas,Hesbollah and other middle east entities recognize Isral,s right to exist Israel will with draw to its 1967 borders correct? I do not have time for anymore comments because I think I hear santas reindeer clippity clopping on my roof. Brad - the objection is that Jews are sayanim, traitors advancing the interests of a foreign government. That's what's wrong with it.